[PDF] The Essentials of Instructional Design: Connecting Fundamental Principles with Process and Practice, Third Edition | Free eBooks Download - EBOOKEE! Posted on 2017-11-09, by luongquocchinh. Description: The Essentials of Instructional Design, 3rd Edition introduces the essential elements of instructional design (ID) to students who are new to ID. The key procedures within the ID process?learner analysis, task analysis, needs analysis, developing goals and objectives, organizing instruction, developing instructional activities, assessing learner achievement and evaluating the success of the instructional design?are covered in complete chapters that describe and provide examples of how the procedure is accomplished using the best known instructional design models. Unlike most other ID books, The Essentials of Instructional Design provides an overview of the principles and practice of ID without placing emphasis on any one ID model. Offering the voices of instructional designers from a number of professional settings and providing real-life examples from across sectors, students learn how professional organizations put the various ID processes into practice. 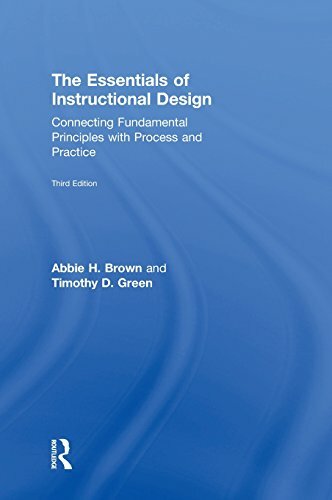 This introductory textbook provides students with the information they need to make informed decisions as they design and develop instruction, offering them a variety of possible approaches for each step in the ID process and clearly explaining the strengths and challenges associated with each approach. No comments for "[PDF] The Essentials of Instructional Design: Connecting Fundamental Principles with Process and Practice, Third Edition".